- "Merci Maîtresse ! - De Rien, C'est Mon Job" (Thanks Teacher ! - It is Nothing, This is My Job) Written by Anouk F. and Published in FRANCE by Cherche Midi Editions. The French Educational System is Highly Centralized and Organized, with Many Subdivisions. It is divided into the Three Stages of Enseignement Primaire (Primary Education), Enseignement Secondaire (Secondary Education), and Enseignement Supérieur (Higher Education). All educational programmes in France are regulated by the Ministry of National Education (officially called Ministère de l'Éducation nationale, de la Jeunesse et de la Vie associative). The head of the ministry is the Minister of National Education. The Teachers in Public Primary and Secondary Schools are All State Civil Servants, making the Ministère the Largest Employer in the Country. Professors and Researchers in France's Universities are also employed by the State. At the Primary and Secondary Levels, the Curriculum is the Same for all French Students in any given Grade, which includes Public, Semi-Public and Subsidised Institutions. However, there exist Specialised Sections and a Variety of Options that Students can choose. The Reference for all French Educators is the Bulletin Officiel de l'Education Nationale, de l'Enseignement Supérieur et de la Recherche which lists all Current Programmes and Teaching Directives. It is amended Many Times Every Year... This BOOK is about the Testimony of Anouk F. a Teacher telling Personal Everyday Stories in an Interesting, Hilarious sometimes and reflecting her Activism towards the Need of Effective Public education. - "Y a-t-il Un Contrôleur Dans Le Train ?" (Is Any Controller in the Train ?) written by Michel CLAREMONTET (Who is a Fench Controllor) and Published in FRANCE by Cherche Midi Editions. Train Controllers manage an Area of Track and Authorise all Activities that take place during a Journey. Train Controllers need High-Level Communication Skills, Critical Thinking, Strong Problem-Solving Skills and the Ability to work under Extreme Pressure and in Emergency Situations. They must have a Good Memory for learning Safety Procedures and Regulations and be able to concentrate for Long Periods on Detailed Information. They have a High Degree of Personal and Decision-Making Autonomy.... This BOOK is a Collection of Personal Stories happened during His Everyday Activities... Often Strange, Crazy and Hilarious. 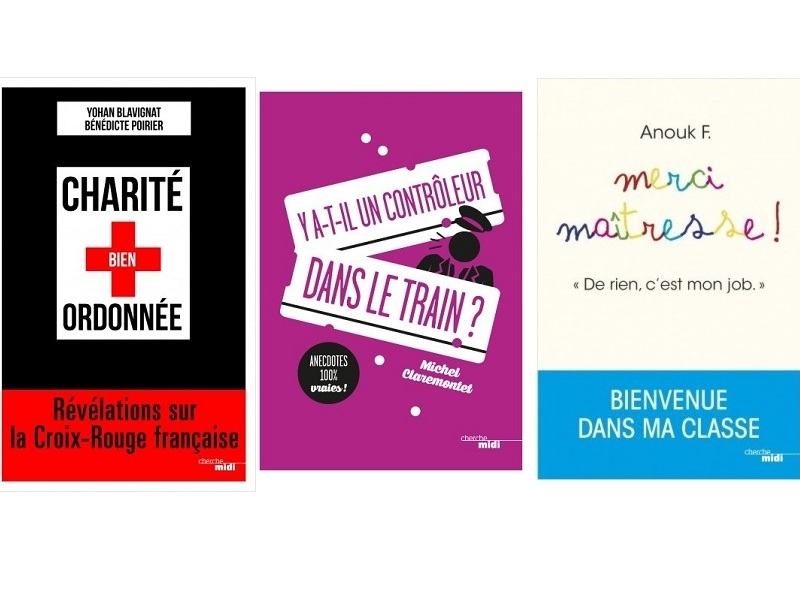 - "Charité Bien Ordonnée - Révélations Sur la Croix-Rouge Française" (Orderly Charity - Revelations about the French Red Cross) written by Two French Journalists Yohann BLAVIGNAT & Bénédicte POIRIER. 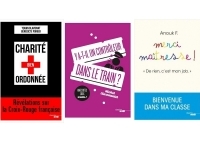 Published by Cherche Midi Editions. The French Red Cross, founded in 1864, is an Independent Charity working alongside Governments and Public Authorities. As a Key Player in Society, they provide Humanitarian, Health, Social, Welfare and Training Services. To help carry out their Assignments they have a Strong Team of 18,000 Employees and 56,000 Volunteers, who on a Daily Basis, pursue Consistent and Unwavering Charitable Principles to provide Local and International Support. In 2015, According to a Report by the French Labour Inspectorate, the Humanitarian Organisation made some 3,800 Violations of Working Hours Regulations, involving 480 Employees at its Paris Headquarters. Of these, around 3,300 Cases involved Employees who had worked more than the Legal Limit of Ten Hours in a Single Day, while the Remaining 500 Related to Staff who had worked more than the Weekly Maximum of 48 Hours. The Organisation had also violated Rules that say Workers must be given a Minimum of 11 Hours off between Shifts, the Inspectorate’s Report found.